ZANE FISCHER IS NOT AN architect, nor is he an engineer. He just got his contractor’s license this spring, which makes the small structure outside his Santa Fe workshop all the more remarkable. It’s called the Saltbox Tiny House, and it just might be the prefabricated home of the future. Created with the help of a giant robot called a CNC machine, the Saltbox might look like just another hipster playhouse, but it’s designed to solve a real-world, large-scale problem. 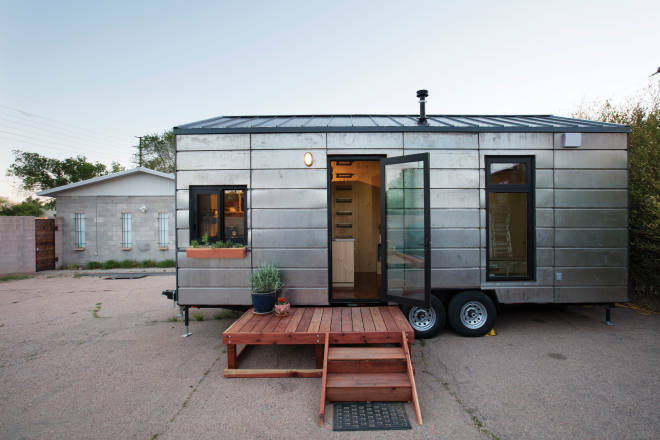 Fischer aims to conquer housing shortages in Santa Fe and beyond by transforming empty lots and other not-so-precious urban spaces into vibrant tiny-house communities. As the CEO of the design-build manufacturing startup Extraordinary Structures, he has created a panelized construction system that can easily be exported: In this newly tech-infused industry, paper blueprints have given way to digital files that can travel across the globe and activate construction on distant CNCs. It’s like 3-D printing for houses. Fischer’s activism as a leader of the burgeoning maker movement has landed him not one but two invitations to a not-so-tiny home: the White House. That’s just the most famous of the remarkable structures that dot the skyline of his personal history. Fischer sweeps some early-spring snow off the wooden porch of the Saltbox Tiny House and opens the glass door. He’s a scruffy fortysomething, dressed casually in a black T-shirt, jeans, and Converse sneakers. “I could very easily live in this space,” he says. There’s a king-size bed, a kitchen, a small loft, a woodstove, a closet and shelves, and a bathroom with a wooden tub—all neatly arranged within 200 square feet atop a trailer. Even with the tall, broad-shouldered inventor strolling around inside it, the space feels surprisingly roomy. That’s partly because of the lofty ceiling and large windows that fill the space with crisp New Mexico sunlight. Inside the warehouse workspace next door, the company’s CNC machine (short for computer numerical control) is on the move. The device’s horizontal robotic arm buzzes across a tabletop, using a drill bit to cut every wooden piece of the insulated panels that form the Saltbox. “It’s very much a modular system of components that lock together,” Fischer says. He built the gleaming Saltbox prototype last winter with a team of just four people, and refers to the panels as “adult Legos” that shuffle and stack to create any structure imaginable. “It seemed to me, from a relatively young age, that houses could aspire to be the ultimate form of sculpture,” Fischer says. He grew up in Bishop, California, a mountain village about four hours north of Los Angeles that calls itself the mule capital of the world. His father was a mountaineering guide who set up a base camp each summer near Temple Crag in the Sierra Nevada. “To me, Temple Crag was like a cathedral or fortress out of Lord of the Rings,” says Fischer. On outdoor adventures with his father, he’d peer through the tent flaps at the mountain and visualize windows and terraces on its facade. “That’s an archetype of my youth, imagining the natural landscape being carved by my tiny hands,” he says. ALAS, FISCHER&apos;S EARLY INTEREST in becoming an architect fizzled when a childhood teacher told him he didn’t have the necessary math skills. He pursued a liberal arts degree with a focus on writing at colleges in Los Angeles, Santa Fe, and San Francisco. In the early nineties, he settled in Santa Fe and worked as an arts administrator at the Center for Contemporary Arts and then as a journalist at the Santa Fe Reporter. It wasn’t until 2008 that he got another crack at his architectural aspirations. In collaboration with local architect Alexander Dzurec of Autotroph Design, he dreamed up a sculptural dwelling for himself. “I told him everything that I wanted, which was a combination of contemporary industrial stuff and ancient ruins,” Fischer says. “Not everyone understands how, when I’m inside of a parking garage, I’m like, ‘This is nice. I could live here.’” Dzurec got it, and helped him design and construct a 1,200-square-foot home with walls made from rammed earth and cast concrete. Among the structure’s many unusual architectural elements is a fabricated steel, Rumford-style fireplace. Since its completion in 2010, the house has won two awards from New Mexico’s chapter of the American Institute of Architects. “None of the way that house is built is incredibly practical. It’s more my flight of fancy,” says Fischer. Still, his time as the owner-builder on the project got him thinking about Santa Fe’s housing shortage, an issue he’d investigated as a journalist. “We have a cost of living and a cost of housing that’s way out of alignment with the wages that are here,” he says. As Santa Fe resists higher-density housing development, more of its workforce is commuting from outside city limits. “That makes for a less vibrant, less diverse community,” says Fischer. Within its steel exoskeleton, the Saltbox Tiny House hides Fischer’s answer. Yes, tiny living is having a moment—Extraordinary Structures appeared on an episode of HGTV’s Tiny House, Big Living last year—but Fischer isn’t in business just to surf a trend. The panelized construction system that’s visible on the interior walls of the Saltbox offers a method to quickly and efficiently build communities between existing city structures, a strategy called urban infill. For now, the startup is taking commissions from local clients and refining their designs. Under the New Mexico Small Business Assistance Program, it worked with engineers from Los Alamos National Laboratory to test and improve the energy efficiency of the panel system’s first iteration. Now Fischer’s team, including partner Katherine Lee, is developing a second version of the panel. In the meantime, Fischer is hard at work as an advocate. He has spoken about New Mexico’s housing shortage at Albuquerque’s TEDx conference and engaged in tiny-living education efforts across the state. Extraordinary Structures works with Make Santa Fe to maintain a “maker space” in its workshop off Siler Road, inviting members of the public to learn about the CNC machine and other high-tech manufacturing equipment.